The Dell-Boomi platform can serve as a single tenant machine residing on multi-tenant structure, in an easy-to-use platform for companies without the need for additional software, hardware, or coding; thereby centralizing the movement, management, and governance of data across organizations and companies. 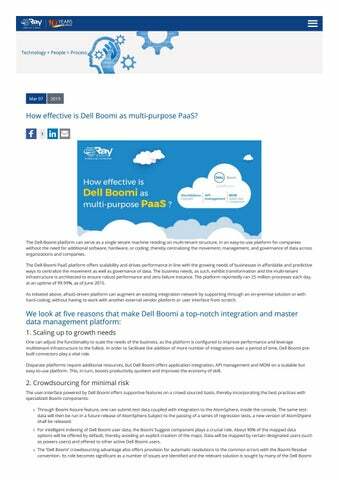 The Dell-Boomi PaaS platform offers scalability and drives performance in line with the growing needs of businesses in affordable and predictive ways to centralize the movement as well as governance of data. The business needs, as such, exhibit transformation and the multi-tenant infrastructure is architected to ensure robust performance and zero failure instance. The platform reportedly ran 25 million processes each day, at an uptime of 99.99%, as of June 2015. As initiated above, aPaaS-driven platform can augment an existing integration network by supporting through an on-premise solution or with hard-coding; without having to work with another external vendor platform or user interface from scratch. We look at five reasons that make Dell Boomi a top-notch integration and master data management platform: 1. Scaling up to growth needs One can adjust the functionality to scale the needs of the business, as the platform is configured to improve performance and leverage multitenant infrastructure to the fullest. In order to facilitate the addition of more number of integrations over a period of time, Dell Boomi prebuilt connectors play a vital role. Disparate platforms require additional resources, but Dell Boomi offers application integration, API management and MDM on a scalable but easy-to-use platform. This, in turn, boosts productivity quotient and improves the economy of skill. users, which are also shared actively by the user community. 3. Automated data-sharing across business applications Enterprise-wide enterprise applications are well-integrated with Dell Boomi platform, achieving desired automation and eliminating redundant applications. The AtomSphere platform serves as a dedicated integration module and acts as the firewall by discreetly activating or sharing data across the distributed applications based on the workflow scenarios at the headquarters or the branch office locations. 4. Consolidation and governance of cross-application data Apart from the integration of data from multiple applications, PaaS enables data synchronization and consolidation by virtue of a critical layer. It drives confident decision-making based on data synchronized across the silos in organizations of varied sizes. The consolidation of data improves the ability to cross-sell and up-sell, thereby enhancing customer experience. Dell Boomi also facilitates regulatory compliance specifically for companies operating in domains with stringent regulations such as pharmaceuticals and financial services in addition to those associated with the healthcare/life sciences discipline. 5. Powerful API management for mobile strategy API management is the basic principle of the hybrid cloud model incorporated by well-known enterprises. The effective management of APIs is one of the crucial industry mega-trends that will lead to the development of upcoming things in computing; and shape the future building blocks of transformation such as the IoT, according to enterprise management gurus. Dell Boomi facilitates API management including its entire lifecycle. The API can be created without explicit coding and can be deployed on the premises or the cloud. A centralized dashboard will also enable close monitoring and control by virtue of a dynamic API environment supported exclusively by the Dell Boomi platform. API management also regulates access to relevant data to vital stakeholders and partners. The legacy application data can be deciphered for being utilized by third-party applications or mobile platforms of vendors and business partners. API management can trigger actions based on the analysis of data across desktop machines as well as IoT-connected mobile devices. About Raybiztech Raybiztech is a leading global Information Technology (IT) Services and Solutions, a CMMI Level 3, ISO 27001:2013 and ISO 9001:2008 Certified Company. We are a Member of NASSCOM, HYSEA, NJTC, and AIIA. 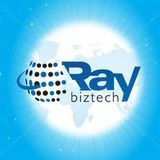 Raybiztech offers comprehensive end-to-end IT Services for Business Application Development, Enterprise Solutions, Enterprise Collaboration Services, Testing and Quality Assurance Services, Cloud Computing and IT Infrastructure Management to organizations in the Banking & Finance, Insurance, Healthcare, Manufacturing, Retail, Media & Entertainment, Leisure & Travel, Telecom and Energy & Utilities verticals as well as Independent Software Vendors.